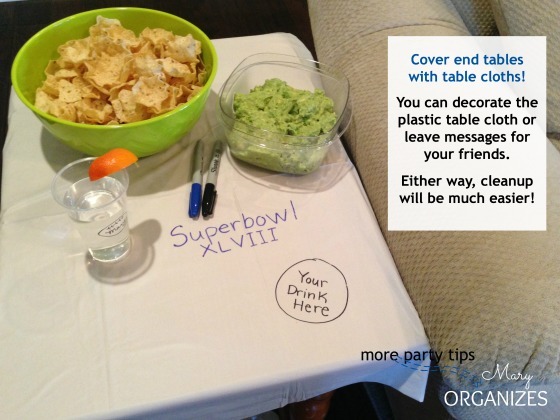 Are you ready to host a Super Bowl party this weekend? Whether your party is big or small, these tips will help you be prepared to have fun! Leave the last minute to get yourself ready or maybe even a nice nap. (A girl can dream, right?!) Get all the food prep done ahead of time. Everyone needs more easy in their lives. 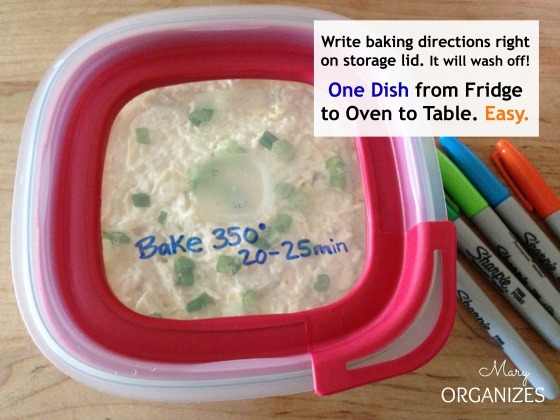 After you prep a dish, write any remaining directions right on the storage lid. It washes off when you clean your dishes! I use Rubbermaid containers, because I love having lids that fit snug and secure. Sharpie markers write on easy peasy. Rubbermaid makes a glass storage container that works as my mixing bowl, then stores in the fridge until it is time to bake. One dish getting messy = Easy! 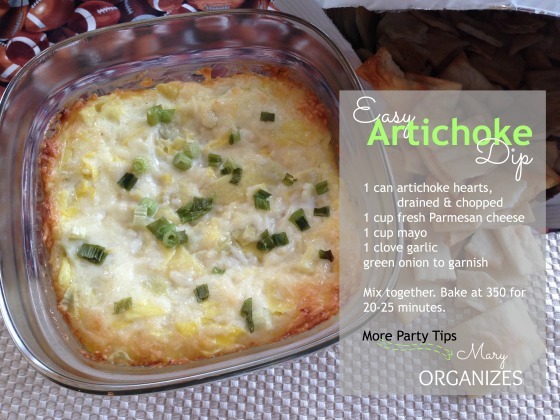 Try a recipe like this Easy Artichoke Dip. Guacamole is a game day favorite, but nobody wants to eat brown guacamole. 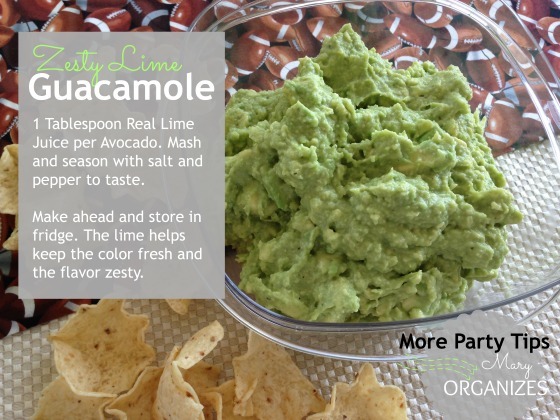 This recipe uses enough lime that the fresh color lasts even when you make it hours ahead of time! Once again, I love making it in the same dish I use to serve it. I found this perfect size in the Rubbermaid section at Target. 3. Prepare Ahead for Easy Cleanup! 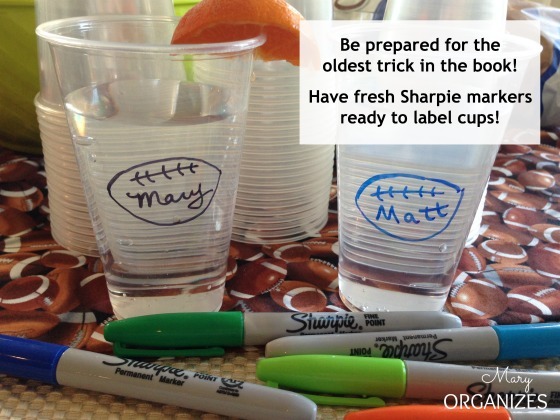 In this case, labeling will also help make cleanup easier! If you’re like me, you have one medium-sized kitchen garbage can with a little recycling basket. Come Super Bowl Party time, my kitchen garbage can isn’t going to cut it. I don’t want to buy additional garbage cans that I won’t need the rest of the year, so I use laundry baskets to double as garbage cans. 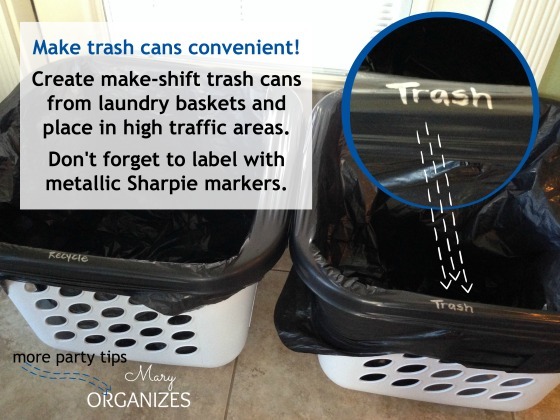 I line them with a large garbage bag and then use a metallic Sharpie marker to label Trash and Recycle. I place these in strategic high-traffic areas to make it easy for people to throw away their own trash, which is helpful when the party is over and it is time to clean up! You’ve probably already thought about a tablecloth for your table, but don’t forget the end tables! They will be used to hold food and drinks too. Don’t stress about coasters, just line the end tables with plastic table cloths. You can write a message or decorate the tablecloth for a festive look. You’ll thank me when it is cleanup time and you simply lift the tablecloth up and throw the mess away. And a bonus tip for you! 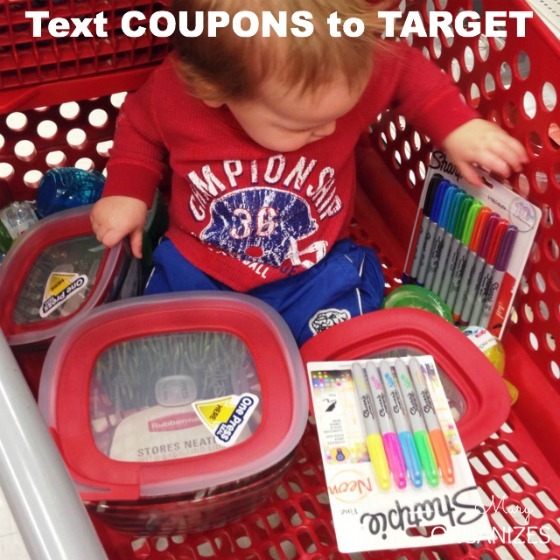 When you text COUPONS to TARGET, you get all the latest coupons. Like $1 off Rubbermaid food storage containers and $1 off Sharpie 4-pack or more. These specific deals last through February 8. Then, we’ll just have to text to find out the new deals. Easy! 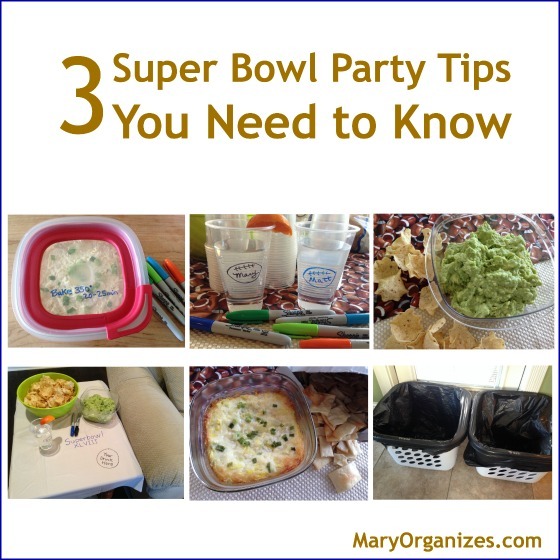 What do you do to make Super Bowl party-throwing easier? Wow!! Thanks, I am having a party, and am going to use these ideas!! Awesome! Hope your party goes well! And I think your ideas are great. If I were having a party I would use them.